Fast food crew downs headsets for three days to protest management actions and poor pay. 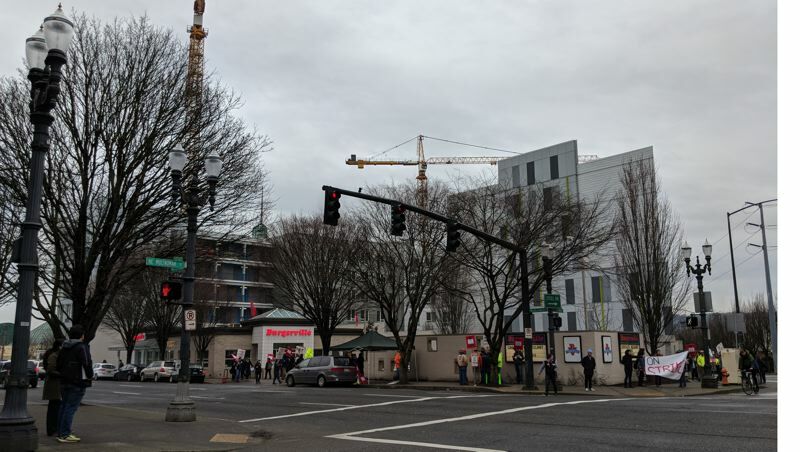 Crew members at the Burgerville restaurant next to the Oregon Convention Center started a three-day strike Friday lunchtime. Around three dozen workers and supporters, including Ironworkers from Local 29, began the action. Picketers marched with signs in favor of a wage hike and accusing Burgerville of being a union buster. They chanted "On strike, shut it down, Portland is a union town," and tried to talk customers out of using the drive-through. The strike was called by the Burgerville Workers Union, which is affiliated with the Industrial Workers of the World. They are calling for $5 more per hour in wages, just as they were in 2016 when the union was formed. Michelle Ceballos, a crew member at Convention Center, was on the picket line with her coworker, Serenity Vickery. "We're striking because we want an end to the union busting and we want recognition so we can get some of our demands met," said Ceballos. "They fired two union members this week, Arsenio and Canaan. They've been surveilling and retaliating, cutting hours, and intimating folks." Vickery has been there three months. She says they demand a $5 an hour raise for all workers. "Right now, most of us get minimum wage which is $11.25." Ceballos says she has been there for a year but only got her 25 cent raise after a review, at 10 months instead of at six months. How likely is it they'll get a $5 an hour raise? "If we get our union recognized we can get a contract. Until then they'll make small concessions but they'll say it's not because of the union," said Ceballos. Dylan Fitzwater is a crew member who works between 20 and 30 hours a week at the Gladstone Burgerville. He was there in support of the strikers. "There have been numerous unfair labor practices at this location and at my location, the Gladstone store. My GM threatened to fire me for putting up printed materials for my coworkers to communicate about the union. Also, they fired a union member on trumped-up charges, for allegedly not paying for two cheeseburgers. They find any excuse they can to get rid of union members." Did the employee pay for his cheeseburgers? "It's pretty common practice for our GM to remind people to pay for them (at a 70 percent discount) because it's kind of ridiculous that we have to pay for them in the first place. But in this case the manager just made a note of it and came back the next day and suspended him and fired him. And he would have paid, that's what he said. He just forgot. This is my understanding, I wasn't there at the store." Fitzwater said there was also surveillance or listening in of conversations about union plans, which is illegal. The struggle has become a war of attrition. According to Chris Merkle, 74 workers at the Convention Center store quit or were fired in 2017, in a store that needs a crew of 35. Kitchen crew member Merkle was outside his store picketing on Friday. He says he works closely with the managers who are inside covering the shifts, and the relationship has been tense lately. He claims intimidation. "Last night there was two managers hovering behind me for most of my shift, listening to my conversations with my coworkers, looking for information about the strike. Also, firing two union workers when there's a week of action coming, that wasn't an accident." What were the firings for? "One was for quote-unquote smelling like pot. The other was for eating ice cream without permission. People snack all the time, they don't give us a staff meal time, we're hungry, we're broke as hell, we get an employee discount and for some people that's most of their food for the day." A Portlander, this is Merkle's full-time job. He says changes in state law designed to make it easier for workers to get their schedules in advance have not applied at Burgerville. He says his hours fluctuate wildly, making it hard to plan ahead or take a second job. He has a colleague who won't strike for fear of losing her job, which could then jeopardize custody of her children. Merkle believes fast food workers are like the coal miners of 100 years ago, and that the Burgerville Workers Union is setting an example for millions of people to protect themselves and improve their working conditions. "I think the union would have our back if I got fired. They'd support us in applying for a new job. Legally we expect to come back to work unconditionally on Sunday." But he is afraid, and feels this is a David and Goliath situation, despite Burgerville's reputation as a friendly, green company. "They hired Bullard Law, who run anti-union campaigns. Some companies like Walmart and Target have their services in house. They've invested thousands of dollars trying to bust the union over the last year and a half." Emmett Schlenz is a drive-through crew member at Hawthorne Burgerville. He was not on strike, but was supporting the strike and is organizing the union at Hawthorne. "We've been public for two years but Burgerville consistently refuses to recognize or negotiate with us, despite our growth and our community support," said Schlenz. "We also filed about unequal enforcement of company policy." For example, the no outside food rule. Schlenz said Rock Star reps came into the store and gave all the workers energy drinks. The union had a victory in December 2017. They argued to get the Convention Center store to close at midnight instead of 1 a.m., so workers could get home on public transport. He says the store managers were on their side that time. "They heard us and they shut it down." But when union members brought in pizza to celebrate, the managers wouldn't allow them. "We put the pizza back in the car and when people got off work we gave it to them," said Fitzwater. Burgerville denied the charges on Friday. "Burgerville respects the right of every employee to support or not support the organization of a union," wrote Beth Brewer, Burgerville's Senior Vice President of Operations in an email to the Tribune. "No retaliation against any employee has or shall occur for engaging in union organizing activities." Update: In a statement Friday the union said it was starting a companywide boycott of Burgerville. 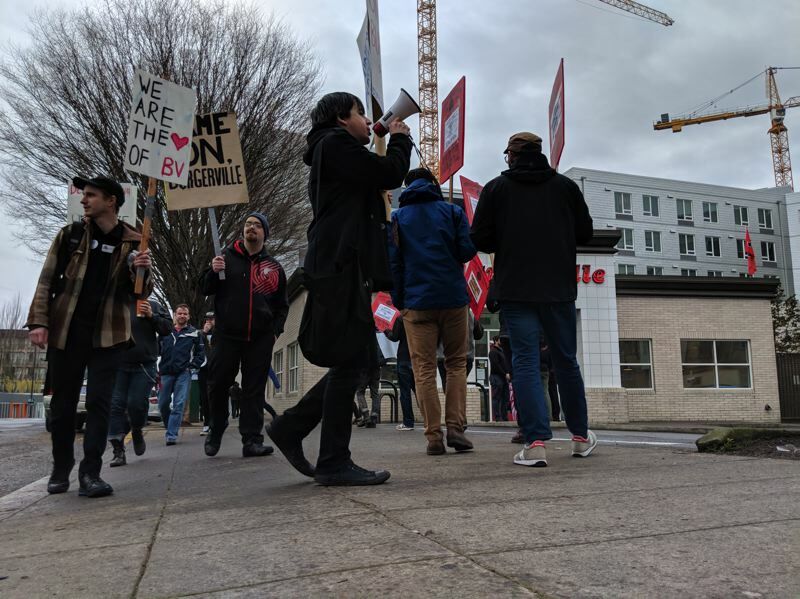 "On Friday 10 workers at the 26th and Powell Burgerville walked off the job and joined workers at Convention Center in striking." The goal was "to bring Burgerville to negotiations over the union's demands. These include a living wage, consistent scheduling, affordable healthcare, and an end to Burgerville's use of e-verify and collaboration with ICE." 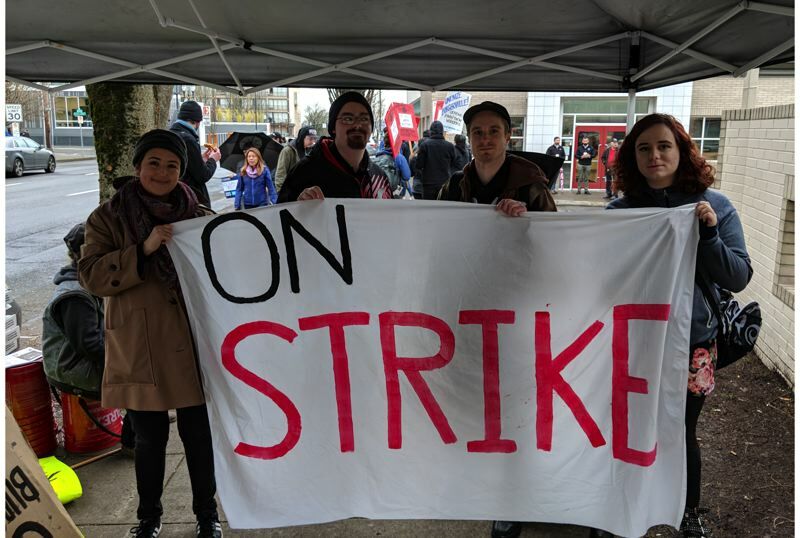 It continued, "The BVWU cites Burgerville's failure to acknowledge these demands, as well as the ongoing strike, as the reasoning behind launching the boycott, and names it as a way people can support the efforts of workers."